Who are you? When you start to explore this question, you find out how elusive it really is. Are you a physical body? A collection of experiences and memories? A partner to relationships? Each time you consider these aspects of yourself, you realize that there is much more to you than any of these can define. In The Untethered Soul, spiritual teacher Michael A. Singer explores the question of who we are and arrives at the conclusion that our identity is to be found in our consciousness, the fact of our ability to observe ourselves, and the world around us. 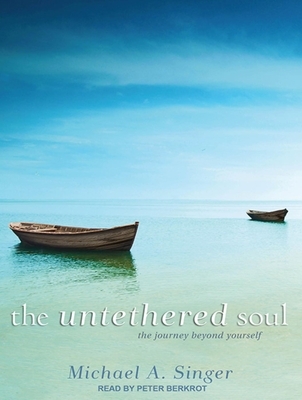 By tapping into traditions of meditation and mindfulness, Singer shows how the development of consciousness can enable us all to dwell in the present moment and let go of painful thoughts and memories that keep us from achieving happiness and self-realization.The Untethered Soul offers a frank and friendly discussion of consciousness and how we can develop it. In part one, Singer examines the notion of self and the inner dialogue we all live with. Part two examines the experience of energy as it flows through us and works to show listeners how to open their hearts to the energy of experience that permeates their lives. Ways to overcome tendencies to close down to the rest of the world are the subject of part three. Enlightenment, the embrace of universal consciousness, is the subject of part four. And finally, in part five, Singer returns to daily life and the pursuit of unconditional happiness. Throughout, the book maintains a light and engaging tone, free from heavy dogma and prescriptive religious references. The easy exercises that figure in each chapter help listeners experience the ideas that Singer presents. Michael A. Singer is the founder of Temple of the Universe, a yoga and meditation center, and the author of "The Search for Truth" and "Three Essays on Universal Law: Karma, Will and Love." A veteran of stage and screen, Peter Berkrot held feature roles in "Caddyshack" and Showtime's "Brotherhood," and his audiobooks include "The Woods" by Harlan Coben and "Country Driving" by Peter Hessler. "Library Journal" described Peter's narration of "When the Whistle Blows" by Fran Cannon Slayton as "a brilliant job of personalizing each of the men in Jimmy's life."